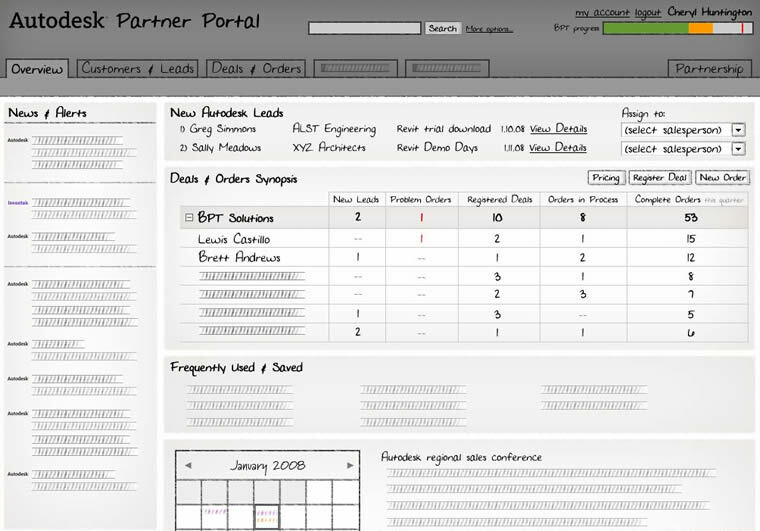 The new Partner Portal provides targeted information to support each sales partner's unique business. Previously, sales tools were spread out across multiple sites. This unified sales tool locator makes it easy for partners to find what they need. Instead of digging through complex Excel files, partners specify a product and see a simple view of the relevant prices and promotions. Behavioral specification for editing the name of stored favorites. An early sketch used to explore data availability and feasibility. Global ethnographic research with Autodesk partners. Persona development and process visualization. Information architecture and navigation development support a diversity of existing and future content. Examined the relationship of pricing to licensing and proposed new models to fit the way partners do business. Worked with brand owners and a Cooper visual designer to assure that the design fit within the Autodesk web style. Strategic site, including fully integrated customer data with just-in-time tools. Tactical site, designed to be built quickly while addressing some of the partners' primary pain points.